The story of Ganesha is one of the most colorful in Hindu religion. 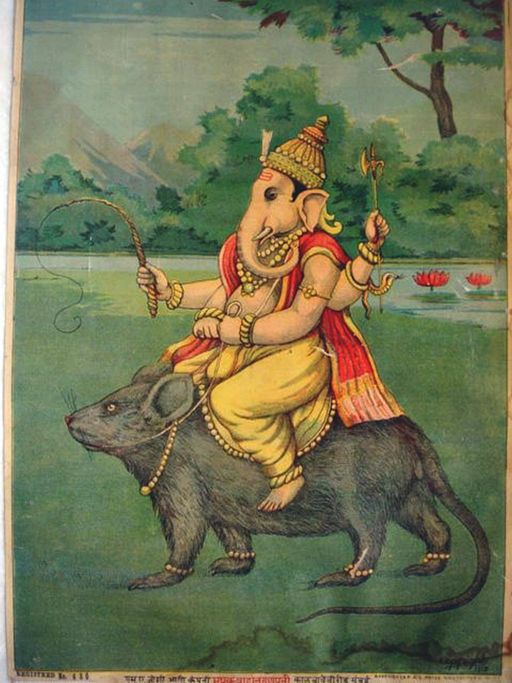 Ganesha, the elephant-headed God, with his pot belly and the tiny mouse for his conveyance, is an object at once of ridicule and reverence. However comic his appearance may be, Ganesha is worshipped as lord of wisdom, and remover of all obstacles. He is worshipped first before Laxmi or Siva or Vishnu and it is only after appeasing him that the other puja may begin. Ganesha’s story is at once tragic and comic, heart rending and ludicrous and is perhaps why it is so easily identified with by the masses. For Ganesha is the ultimate protagonist, one who is diligent and persevering, who undergoes unwarranted suffering and shame and is finally redeemed and given his rightful place. Although the story is familiar to most, how Parvati while her husband Shiva is away, makes a beautiful boy from flour and water and sets him guard at her door, how Shiva returns eager to meet his consort and is affronted by the sincere child who will not let him pass, how Lord Shiva in a rage, chops off the innocent’s head and how Parvati when emerging from her bath to see the tragic outcome, becomes distraught, leading Shiva to fetch an elephant’s head to replace the lost head of Ganesha, and bring him back to life. Eventually Ganesha is made lord of wisdom by his parents and each year on Ganesh Chathurti, people worship the elephant headed God, who is appealed to by every student before examinations, to anyone who faces obstacles or challenges and to all those who begin a new venture. But what is the symbolism behind this story and what is it that is being taught? For we often forget that behind the colorful, passionate or even violent fables and characters in Hindu mythology, there is always an underlying message, a deep and profound lesson to be learned which reflects the highest philosophical truth. What often happens in the telling and retelling of myth is that the original meaning gets lost beneath the sensational and shocking events themselves. Children are frightened by the paternal rage which leads to Ganesha’s head being chopped off, and they laugh at the episode where Ganesha bursts open and all the various sweets come tumbling out. It is hard for them to respect this God who apparently has no control over events or over his own body. Often in an attempt to inculcate a blind respect for God, we override the subtleties of meaning which myth contains. Ganesha, Kumaraswamy, Shiva, Parvati, all are various aspects of one’s self. No one aspect needs to be worshipped or revered blindly, but must be given its appropriate place in one’s development. It is only when we understand this that we can gain the most insight from these beautiful stories. According to Swami Prajnanananda, the story of Ganesha is nothing more than the story of the soul’s struggle to attain salvation. Parvati in this story represents the spiritual seeker in all of us, that part of us which wishes and struggles to reach realization. In an attempt to reconcile with God, as represented by Shiva, Parvati works sincerely or meditates and the fruit of that meditation is Ganesha. Once having achieved some success, however, the seeker becomes egotistical. Parvati is proud of her accomplishment and dotes upon her “son” giving him supreme power to guard her consciousness, the doorway through which God must enter, not allowing for the inexperience, the ignorance and the blindness of this child, the ego. Setting her ego at the door, she becomes immersed in other activities. And so it is no surprise, that when the time to merge with God finally arrives, and He arrives at her doorstep, her brash and overly confident ego confronts Him, refusing him entry, unable to recognize God. Since it is only through destruction or elimination of the ego that God can be realized, Shiva, in his infinite love for the seeker, chops off the head which denies Him entry and hurls it away. At last, Shiva and Parvati can reunite. But the seeker is left distraught by the destruction of her spiritual gain and so Shiva replaces the ego with the spirit of learning and breath control which is represented by the elephant’s head. The myth of Ganesha does not end with his coming back to life. Shiva and Parvati eventually have another son, Kumaraswamy. This young god is the antithesis of his elder brother. While Ganesha is studious, absorbed in learning and meditation, Kumaraswamy is active, physically fit, handsome and alert. When the time comes to select who is fit for the position of lord of wisdom, Kumaraswamy challenges the obese and sedentary Ganesha’s right. Being the more active, heroic, and personable of the two he feels he should be selected. Shiva then sets a test for the two brothers. He asks that they make a pilgrimage of all the holy places and whoever comes back first would be the winner. Kumaraswamy sets off in high style on his peacock sure of success, but is amazed when he sees his brother preceding him wherever he goes. Defeated, he comes back to find that Ganesha has never stirred from Kailasha except to circle Shiva and Parvati themselves, knowing as a result of study and meditation, that within them is contained the entire universe. Having proven his superiority, Ganesha is crowned lord of wisdom. This part of the story shows how intellect and deep meditation are vastly superior and more effective than physical strength and furious activity. But the beauty of Indian mythology is the various gradations of meaning and truth contained within its fables. The story continues…there is more to be gleaned from its content. After being crowned lord of wisdom, and after his brother is crowned commander in chief, Ganesha indulges in feasting. So greedily does he devour the sweets and fried food that while making obeisance to his parents, he is unable to keep his balance. The moon, perched on Shiva’s head, cannot help but laugh at his sad predicament, and in the same instant, poor Ganesha’s belly explodes resulting once again in his demise. The moon is cursed by Parvati for his insolence and Ganesha is brought back to life, but what is important here is the need for balance that is being stressed. Shiva and Parvati have two sons. Ganesha, however superior in intellect, is unduly sedentary and completely ignores his physical well being. Gluttony and lack of physical exercise take their toll and he becomes an object of ridicule as well as endangering his own life. Kumaraswamy, the epitome of total control over the senses and body, on the other hand, is obsessed with physical prowess. This leads to vanity, arrogance and a lack of mental growth. What is needed then, is a balance between the two. Neither alone can be completely successful. Meditation and physical exercise, learning and activity, and a tolerance and respect for difference, all combine to make one a truly wise and enlightened being. This entry was posted in Uncategorized and tagged ganesha, hindu mythology, hinduism, myth, spirituality, vinayaka. Bookmark the permalink.